The announcement on 1st February by the United States that it is suspending its compliance with the INF Treaty, with full withdrawal to follow in August, marks a major and dangerous step on the road to a new nuclear arms race. Suspension or withdrawal paves the way for the US to develop and deploy the classes of medium and shorter-range nuclear missiles outlawed under the Treaty, and would likely be met by similar actions on the Russian side. The Treaty, signed by Presidents Reagan and Gorbachev in 1987, eliminated all US and Russian nuclear missiles with ranges between 500 and 5,500 km. It has been widely regarded as one of the most successful international nuclear arms reduction measures, removing a whole class of weapons which had largely been targetted at European cities in the event of hostilities between the former USSR and the US. Since 2014, both the US and Russia have alleged that the other state is in breach of the treaty through the development on new nuclear-capable missile systems, although neither side has published conclusive evidence of this. "At a time when the world already faces unprecedented crises in the form of climate change, regional conflicts and refugee movements, it beggars belief that the leadership of any civilised state would open the gates towards expanding its capacity to destroy life on earth through the development of new nuclear weapons systems", said Dr David Hutchinson Edgar, chairperson of the Irish Campaign for Nuclear Disarmament. "Alleged breaches of the INF Treaty should be dealt with through the appropriate international legal mechanisms, such as the Treaty's own Review Commission or the ICJ", he continued. "Ripping up a Treaty which has worked effectively for over thirty years is an outrageous and irresponsible action which can only serve to jeopardise world peace further at a time when international stability is possible less secure than at any time since the end of the second world war. "We now know that luck played a large part in averting a nuclear catastrophe on several occasions during the cold war. In the event of a renewed nuclear arms race which would involve at least the United States, Russia and China, the world may not be so lucky. "We believe it is imperative that all nuclear-armed states, not just the US and Russia, fulfil their obligations to disarm as specified under the Treaty on the Non-Proliferation of Nuclear Weapons. The obvious way for them to do so is to engage with the Treaty on the Prohibition of Nuclear Weapons, negotiated in 2017 with the support of over 120 countries. "In particular, we urge the Irish government to prioritise the ratification of the Treaty as a matter of urgency. We also call on the Irish government to work with our European colleagues to ensure that any future American requests to site nuclear missiles in EU member states will be refused." On Wednesday, 17th October, Irish CND will have the privilege of hosting two hibakusha from Hiroshima on a one-day visit to Dublin with Peace Boat, a Japan-based international NGO which is represented on the steering group of the International Campaign to Abolish Nuclear Weapons (ICAN), the 2017 Nobel Peace Prize winners. Ms Tsukamoto Michiko was 10 years old at the time of the bombing, and Ms Sora Tamiko was 3 years old. Both were affected by radiation exposure in the aftermath of the bombing. A number of events have been organised in the course of the day, including meeting officials at the Department of Foreign Affairs to discuss Ireland's role in the Treaty on the Prohibition of Nuclear Weapons, and a reception hosted by the Lord Mayor. They will hold a joint press/political briefing at 16:30 in Buswell's Hotel, followed by a conversation on their experiences and hopes for a nuclear-weapons-free world with local peace campaigners. 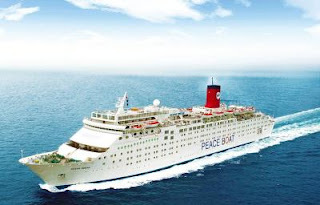 Peace Boat left the Japanese port of Yokohama on September 1st on its current Global Voyage for Peace, and will return there on December 17th, after visiting 24 ports across Asia, the Mediterranean region, western Europe and North and South America. The annual commemoration for the victims of the Hiroshima atomic bomb will take place on Monday, 6th August, the 73rd anniversary of the bombing, at 1.10 p.m. at the memorial cherry tree in Merrion Square park, Dublin 2. An estimated 80,000 people were directly killed by the bomb dropped on Hiroshima, with casualities reaching 140,000 within a year. Approximately 15,000 nuclear weapons remain in the world today. While this is less than the Cold War peak, it is still enough to destroy life on earth as we know it many times over. The ceremony will take place at the memorial cherry tree planted by Irish CND in 1980. Ms Kotoha Itakura, Political Attachée at the Japanese Embassy in Ireland, and Cllr Claire Byrne, representing the Lord Mayor of Dublin, will speak at the ceremony, as will the President of Irish CND, Canon Patrick Comerford. There will be short contributions of poetry and music from Irish and Japanese artists (weather permitting) and the laying of a wreath at the memorial tree. Representatives of several other embassies will also be in attendance. This annual ceremony gives us all an opportunity to stand in solidarity with the victims of these horrific weapons of mass destruction, and to affirm our determination to work for their elimination, the only way to ensure that the ghastly events of Hiroshima and Nagasaki will not be repeated. Please do come and attend this moving and inspiring ceremony if you can. On Sunday 5th August, the Galway Hiroshima Peace Event will take place in Eyre Square from 1.00 p.m. The event will include music, dance and an address by Frank Keoghan of the People's Movement. The choice for the world in 2018: Fire and fury, or peace? "They will be met with fire and fury, and frankly power the likes of which this world has never seen before." "Processions of ghostly figures shuffled by. Grotesquely wounded people, they were bleeding, burnt, blackened and swollen. Parts of their bodies were missing. Flesh and skin hung from their bones. Some with their eyeballs hanging in their hands. Some with their bellies burst open, their intestines hanging out. The foul stench of burnt human flesh filled the air." Which is more chilling? Setsuko Thurlow's eyewitness description of the horrific destructive power of the nuclear bomb which obliterated her hometown of Hiroshima in the summer of 1945, or President Donald Trump's thinly-veiled threat to unleash nuclear weapons amid the volatile mix of international relations in the summer of 2017? The past year saw nuclear weapons thrust back to the top of news headlines with more prominence than any time since the end of the Cold War. North Korea's missile and nuclear tests, trading provocations with Trump's belligerent rhetoric, returned the spectre of nuclear destruction to public consciousness around the world. As 2017 drew to a close, former chair of the US Joint Chiefs of Staff Admiral Mike Mullen warned that the threat of nuclear war is, in his opinion, closer than ever before. Concern that nuclear weapons might actually be used (again) is an inevitable consequence of their continued existence. Only by outlawing and eliminating nuclear weapons can the world as we know it be safe from the threat of nuclear destruction. At a time when the structure of life on earth faces unprecedented threats on a huge scale, such as global warming and plastic pollution, getting rid of these ghastly weapons of mass destruction should be a relatively simple step towards a safer world. During the past year, despite the shadow of a possible war, we have also seen positive signs that the world has woken up to the need to deal conclusively with nuclear arms. Over 120 countries - a substantial majority of UN member states - took part in two lengthy sessions of negotiations which resulted in the Treaty of on the Prohibition of Nuclear Weapons (TPNW) becoming a reality in July 2017. From an Irish point of view, it was very positive to see Ireland as one of the proposers of the initial UN resolution which set up the talks, and as a strong advocate for a robust treaty during the negotiations. While the new treaty will not eliminate nuclear weapons overnight, it has the power to create a new international norm whereby, for the first time, development, possession, use, and the threat of use of nuclear weapons are clearly illegal. Providing assistance with any of these activities will also be illegal. Ireland was among the first states to sign the treaty when it opened for signature at the UN in September, and Irish CND will continue to work with politicians of all persuasions for speedy ratification of the treaty by the Oireachtas in 2018. The award of the 2017 Nobel Peace Prize to the International Campaign to Abolish Nuclear Weapons (ICAN) highlighted both the urgency of nuclear disarmament, and the shift in international momentum in favour of meaningful steps towards nuclear abolition. Irish CND is proud to be one of ICAN's partner organisations. The Nobel Peace Lecture, delivered by ICAN's Executive Director, Beatrice Fihn, and Hiroshima survivor, Setsuko Thurlow, sets out a powerful rationale and a clear road map for nuclear disarmament. As Beatrice Fihn said during the lecture: "Nuclear weapons, like chemical weapons, biological weapons, cluster munitions and land mines before them, are now illegal. Their existence is immoral. Their abolishment is in our hands. The end is inevitable. But will that end be the end of nuclear weapons or the end of us? We must choose one." You can view ICAN's latest campaign video, including extracts from the Nobel lecture, here. As we look ahead to 2018, we hope that we will see this positive momentum towards a safer world continue to grow and bring results. Formal ratification by Ireland of the TPNW will be a priority for Irish CND's work. We will also work to promote the treaty, and meaningful steps towards disarmament, through our shared work with our international partners. On Sunday, 10th December, the 2017 Nobel Peace Prize was presented to the International Campaign to Abolish Nuclear Weapons (ICAN). The award was accepted on behalf of ICAN by Setsuko Thurlow, who was a 13-year-old schoolgirl in Hiroshima when the city was bombed in 1945, and Beatrice Fihn, Executive Director of ICAN. As a partner organisation of ICAN in Ireland, Irish CND is proud to share in this award. We acknowledge the tremendous work of hibakusha (literally, explosion-affected people) like Setsuko Thurlow in keeping the utter horror of the impact of just one nuclear weapon in public consciousness, the visionary campaigning of ICAN's small, dedicated staff, and the committed partnership of campaigners across more than 100 countries working together for a better, safer world. The award highlights ICAN's role in working for an international treaty explicitly outlawing nuclear weapons, which came to fruition earlier this year with the approval by the United Nations of the Treaty on the Prohibition of Nuclear Weapons. Since September, the treaty has already been signed by over 50 countries, including Ireland. This award also recognises that the ghastly spectre of nuclear warfare has not gone away; although there are less nuclear warheads now than at the height of the Cold War, there are still enough to destroy life on earth as we know it many times over. The volatile state of international relations today makes their detonation - through reckless political leadership, through a terrorist attack, or through accident - as probable, if not more probable, than at any stage since 1945. The level of silent threat is truly frightening. In many ways, the award is an elegy for 70 years of failure to address the appalling potential for destruction posed by nuclear weapons. Rather than recoiling from their horror, a small number of states embraced their terrifying possibilities. Despite the obligation to negotiate nuclear disarmament in good faith imposed on the nuclear weapons possessors who signed up to the 1970 Non-Proliferation Treaty - France, China, Britain, Russia and the United States - these states have refused to engage seriously with genuine disarmament; on the contrary, they continue to renew their nuclear arms capabilities. Their bad faith in terms of their lip-service to the NPT while undermining it with their actions stands to their shame. Equally, the acquisition of nuclear weapons by India, Pakistan, Israel and North Korea brings not elevated status, but dishonour on their countries. One such state - South Africa - has destroyed its nuclear weapons. A co-sponsor with Ireland, Austria, Brazil, Mexico and Nigeria of the UN resolution which eventually led to the Prohibition Treaty, South Africa is now a leader in working for nuclear disarmament. Failure also lies both with campaigners for disarmament and non-nuclear weapons states opposed to the continued existence threat of nuclear arms, in terms of their inability over decades to present a powerful, coherent discourse moving forward the urgency of disarmament. In 1985, the Nobel Peace Prize was awarded to International Physicians for the Prevention of Nuclear War. Frustratingly, over 30 years have passed since then, but nuclear weapons are today a greater threat than ever. In this gloomy scenario, this year's award acknowledges a moment of genuine opportunity and hope: not in the award itself, but in the way that the Treaty on the Prohibition of Nuclear Weapons has changed to landscape in relation to the development, possession and threat of use of nuclear weapons. There is now an international legal instrument which explicitly bans nuclear weapons, negotiated by a sizeable majority of UN member states, which will enter into force once ratified by 50 states. Under the umbrella of ICAN, civil society campaigners, scientists, medical and legal experts across the world have joined forces with non-nuclear-weapons states to create the conditions for this new treaty to come into being. The momentum has changed. An international stigma, codified in law, now attaches to nuclear weapons possession - and the nuclear weapons industry - as never before. The initiative has been seized by those who believe that a safer world is created by removing the threat of absolute destruction, not by maintaining or recklessly increasing that threat. The new treaty is just a step, but still a significant step in the right direction. There is now a moment, right across the world, when people can see not only the threat, but the hope that there is a way out of this threat: an alternative to destruction. Ignorance, denial, powerlessness, resignation - negative impulses which have stood in the way of progress towards nuclear disarmament - have been faced down by the clear scientific evidence and political realism which made the treaty a reality. We in Irish CND welcome the constructive role the Irish government has played in supporting the Prohibition Treaty process, and the fact that Ireland was among the first states to sign the treaty in September. We urge the Irish government to ratify the treaty formally at the earliest opportunity, and to transpose its provisions into Irish law. The opportunities of this moment must be seized by all those committed to consigning these weapons of mass destruction to the dustbin of history. An award, even one as prestigious as the Nobel Peace Prize, is not victory. The Nobel Peace Prize gives renewed vigour, prestige and impetus to our campaign. Victory still lies ahead in the goal of a nuclear-weapons-free world. The campaign continues tomorrow, and the next day, and the day after that, until that goal is reached. The announcement that the 2017 Nobel Peace Prize is being awarded to the International Campaign to Abolish Nuclear Weapons (ICAN) represents a timely recognition of the urgency of ridding the world of these horrific weapons of mass destruction. Making the announcement, the Norwegian Nobel Committee stated that the award is for ICAN's work "to draw attention to the catastrophic humanitarian consequences of any use of nuclear weapons and for its ground-breaking efforts to achieve a treaty-based prohibition of such weapons." The Treaty on the Prohibition of Nuclear Weapons, negotiated earlier this year, opened for signature at the United Nations last month. With headquarters in Geneva, ICAN currently has 468 partner organisations in over 100 countries, including the Irish Campaign for Nuclear Disarmament. In its response to the announcement, ICAN stated, "The treaty categorically outlaws the worst weapons of mass destruction and establishes a clear pathway to their total elimination. It is a response to the ever-deepening concern of the international community that any use of nuclear weapons would inflict catastrophic, widespread and long-lasting harm on people and our living planet ... This is a time of great global tension, when fiery rhetoric could all too easily lead us, inexorably, to unspeakable horror. The spectre of nuclear conflict looms large once more. If ever there were a moment for nations to declare their unequivocal opposition to nuclear weapons, that moment is now." Commenting on the award, Irish CND chairperson Dr David Hutchinson Edgar said, "It is very exciting to see the work of international campaigners for a world without nuclear weapons receive this kind of prestigious recognition. It is a tribute to the tireless work of activists, researchers, survivors of atomic testing and of the 1945 atomic bombs, and many others who have come together under the umbrella of ICAN to try to bring their vision of a safer, more peaceful world to reality. "At the same time, the award implicitly acknowledges that the continuing existence of nuclear weapons poses a grave threat to life on earth as we know it. That threat is as great - perhaps greater - today than ever before. Recent belligerent actions and rhetoric from certain states have brought its terrifying reality into focus. They have also shown the utter bankruptcy of the argument put forward by nuclear-armed states that nuclear weapons help keep the world safe: safety laced with the spectre of annihilation is an absurd fallacy. "We welcome the leading role that Irish diplomats have played in bringing the Treaty on the Prohibition of Nuclear Weapons into existence, and the fact that Ireland was among the first group of states to sign the treaty. We appreciate the constructive co-operation which took place between the Disarmament Section of the Department of Foreign Affairs and civil society organisations, particularly ICAN, during the negotiation process. We look forward to Ireland speedily ratifying the treaty, and hope that our politicians and diplomats will use their influence internationally to promote the urgent need for other states to do so also." As the Treaty on the Prohibition for Nuclear Weapons opened for official signature at the United Nations on 20th September, fifty states signed the treaty within a matter of hours, with more expected to do so in the coming weeks. The Treaty will enter into force once it has been formally ratified by fifty signatories. Irish CND welcomes the fact that Ireland, represented by Minister for Foreign Affairs, Simon Coveney, was among the states to sign at the opening. In 2016, Ireland was one of the co-sponsors of the UN Resolution which established the negotiations for the Treaty. President Michael D. Higgins has issued a statement welcoming the treaty, acknowledging both the work of Irish diplomats and Ireland's partner countries in promoting the negotiations, and also praising the role of civil society activists and researchers. Irish CND works for the global elimination of nuclear weapons.